My neighbor planted identical shrubs on either side of the walk up to her front door. The one on the left looked perky while the one on the right was drooping and beginning to wither, turning from deep purple to brown. I’m not a green thumb but when she told me her watering strategy, I had some idea of what was going on. Here’s what had just gone down at our house. My 8 year old Sweet Pea and I planted lettuce, carrots and parsley seeds in our kitchen window box. With the water on very low, we moistened the soil consistently for 5 minutes everyday for 3 weeks. Then we stopped. Although we continued to admire our now growing seedlings, we didn’t water them for almost two weeks. Once we started watering again the liquid pooled on top of the now crusty soil. It collected and ran down the sides of the box, away from the target to the ground below. Water wasn’t moistening our precious seedlings. What I learned from this experience is that water absorbs into moist soil MUCH more readily then in does in dry. If you’re a gardener you’re probably saying duh! 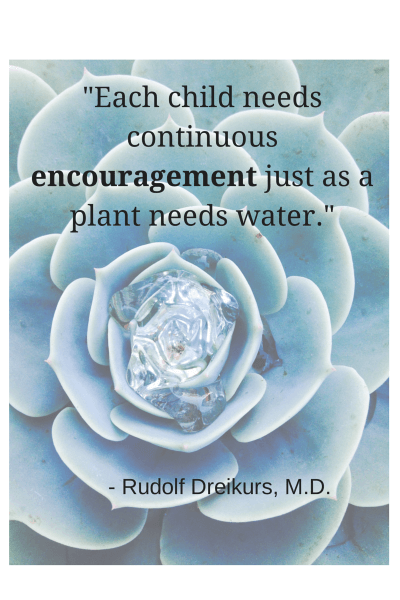 The quality of effective encouragement is like effective watering – the regular trickle seeps in with steady nourishment. In contrast, the blast of a fire hose makes everything look and feel wet in a burst, but doesn’t penetrate the soil to reach the roots. Like the freshly planted withering shrub, children who are given the standing ovation, bask in momentary glory, but don’t get the benefit of the deep root watering. On the other hand, the child who’s given small doses of water on a consistent basis, may not feel the big swells of pride, or show the glistening drops on their leaves. The encouragement they receive may be quiet and not even perceived by anyone other than the child. Living in moist soil, the child continually feels it’s steady condition as part of her foundation. No run-off effect. You are SO smart – I’m so proud that you got an A! You’re teacher just doesn’t get how smart you are – you really need a more challenging environment. Wow – you played so much better than all the other kids out there on the field – way to go! Everything you make is so beautiful – you are a true artist! A child may be quick to give up if they don’t think they’ll succeed easily. Sibling relationships are difficult because praise breeds better than/worse than feelings. A child is more likely to focus on internally driven tasks. A child is more likely to persist at difficult tasks because the risk of failure is not an issue. Sibling relationships potentially more harmonious. To get a visceral sense of the distinction between these lists put yourself on the receiving end of the statements below. You’re amazingly smart – I’m so proud that you got an A! Margie, you’re teacher just doesn’t get how smart you are – you really need a more challenging environment. Wow John, you played so much better than all the other kids out there on the field – way to go! Everything you make is so beautiful Stacy – you are a true artist! What’s it feel like for you? For me it feels good – really good. And when I sit for a minute, I feel a bit uneasy, nervous even. Now do the same for the encouragement. You studied long and hard for that test Victoria. You must feel proud of yourself. (Effort is acknowledged and seen as positive). If you’re like me, there’s no jolt this time around but you feel deep down good. Solid. Connected. Place sticky notes in key places (bathroom mirror, car dash) with encouragement phrases you like (Questions beginning with what and how, “I notice…”, “I have faith…,” eye contact, etc. Be gentle with yourself as you integrate new language, know that it will take time and will make a difference. Explore your own water source. Where is it and how do you tap into it? Do you need to find more sources? Email me with what you discover and let me know if you would like more support from me. Sure, I slip back into praise sometimes but I keep in mind Jane Nelsen’s wise words – Praise is like junk food, too much of it will make you sick so dole is out sparingly. To see more examples, check out this article in the New York Times Magazine. Much of this post is based on research by Carol Dweck and published in Mindset. My neighbors’ shrub is doing much better. Is there an area in your garden that needs a steady trickle? Great post, Lisa. The difference is subtle! But it really is about putting the “Locus of Control” back on the child… they need to please themselves, ultimately, not adults. I love the metaphor of the moist earth… say something positive every day!